Barack Obama is making an enormous mistake on the most important initiative of his presidency. In recent weeks, Obama has stressed that health care reform is the essential ingredient for the success of his economic recovery plan. Yet the president, easily the most gifted White House communicator since Ronald Reagan, has the message all wrong. “Our businesses will not be able to compete, our families will not be able to save or spend, our budgets will remain unsustainable unless we get health care costs under control,” Obama said in his radio address Saturday. He has said the same thing on many other occasions, almost always stressing the threat of runaway cost. When Obama talks health care, it’s cost, cost, cost. But that’s not what people want to hear, or at least not all they want to hear. Of course they complain about the expense of medical treatment, but controlling cost is not their top health care concern. “Americans will prioritize cost over quality right up until the moment they realize that it’s their quality that they are sacrificing,” writes the Republican pollster Frank Luntz in “The Language of Healthcare 2009,” a brilliant new analysis of the public’s health care concerns that also serves as a roadmap for defeating Obamacare. Basing his conclusions on extensive polling and focus-group research, Luntz writes that the public is very worried that a government takeover of health care — Obamacare — will result in politicians and government bureaucrats making decisions about what kind of care patients will receive and when they will receive it. That was Barack Obama at Notre Dame on Sunday. A very liberal president at a very liberal university saying what people want to hear: we can all get along. There is middle ground. But those words could have come from “moderate” Republicans like Lindsay Graham too. Graham said on Sunday that he wanted Republicans to win: and was ready to fall back and make concessions on some issues like abortion. So leaders in both parties seem ready to say what it will take to get elected. Gone is the man or woman ready to say what he or she really believes, it seems. And stick to those positions. Meanwhile more voters now seem to be saying that abortion is wrong…. A few years after George Bush said, “You are either with us or against us,” nobody seemed to be with him. The lesson many politicians learned, and Barack Obama more than most, was to just say what makes people feel good. We’ll close Gitmo. We’ll end military tribunals. We’ll get out of Iraq (and fast). I didn’t hear Jeremiah Wright. There’s middle ground on killing or not killing babies. We can spend borrowed money to create jobs, cure the environment, get global education and health care and never mind the debt…. The pendulum may be swinging the other way……Back toward reality. At the White House today Barack Obama will be faced with reality in the form of Benjamin Netanyahu who really does believe President Ahmadinejad when he says he wants to erase Israel from the map. Middle ground could come with some expense. Republicans are getting inspiration on how to rebuild their party in the U.S. Congress from an unlikely source: White House Chief of Staff Rahm Emanuel. California Representative Kevin McCarthy, the chief recruiter for House Republicans, said he wants his party to select candidates based less on ideology and more on their chances of winning. The goal, he said, is to seek out prospects who are ethnically diverse, female, less partisan and even supportive of abortion rights. So far, these efforts are more concept than reality. Emanuel, a former U.S. representative from Illinois, put the template into practice in 2006 when he was leading the Democratic Congressional Campaign Committee. Candidates he recruited won in Republican districts by holding positions uncommon for Democrats such as opposition to abortion and support for gun rights. In the 2006 election, Emanuel, 49, recruited anti- abortion, pro-gun candidates such as Brad Ellsworth, 50, a sheriff in Indiana, and Heath Shuler, 37, a former NFL quarterback, in North Carolina. The premise: identify candidates whose views best mirror those of their districts’ constituents rather than Democratic Party orthodoxy. Madame Speaker, please resign now. 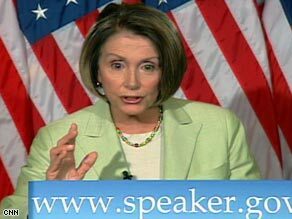 Speaker of the House Nancy Pelosi has now become more than a distraction. She has risen above that. Pelosi is now a dangerous distraction to the Obama agenda that gives life to the Republicans and emboldens dissent on every issue she and the Democrats are pushing. The president needs to ask Pelosi to resign. Now. Pelosi is doing more harm than the former head of GM, who Obama gleefully discharged. If Obama does not do that — if he fails to ask Pelosi to step down or he delays action — he will harm his own chances of future success. Keeping the interrogation debate fueled, as Pelosi did today, can easily kill all chances to get a health care bill this year. If the president asks for Pelosi to resign, he still has some hope of getting his agenda and his administration back on track. Pelosi took the lead on the “stimulus” earlier this year, and so far Obama has not taken any heat for the sorry details contained in that bill. Now Pelosi has said she’ll be the lead sled dog on health care: which should not please Obama, Rahm Emanuel or any red blooded American one bit. This is a time for Democrat discipline — a trait that party is not known for. By keeping Pelosi, Obama risks undisciplined, lurching action in the House of Representatives — where he enjoys a huge Democrat majority that should be translating into rapid fire, disciplined action on all front. In stead, it is now a safe bet that Republicans will join Pelosi in her request for a “Truth Commission” — and that train can go in any number of uncontrollable and unpredictable paths. Pelosi has mixed politics and national security and national intelligence issues into an untenable Gordian Knot. Her own staff has already threatened other Democrats not to initiate ethics complaints. Pelosi has only been allowed to continue her questionable practices because of an understanding, all Obama loving media. Ms. Pelosi has abused her office and sacrificed what little confidence the American people had in the Congress to change the tone and move forward: not look back. And she has done so by lying and by asking us all to lose trust and faith in the American intelligence service…..
Republican Discord: Steele vs Romney; Huckabee vs Cantor, Boehner, Pence, Alexander, McConnell & Kyl. President Obama poked fun at the travails of the Republican Party last weekend, telling the party’s chairman that no, the GOP does not qualify for a bailout, and conservative radio host Rush Limbaugh does not count as a troubled asset. Though the president was just looking for a laugh at the annual White House Correspondents dinner, Republicans have a tough road ahead as they try to rehabilitate their party. In recent weeks, the GOP has received more attention for a steady spout of infighting than it has for its message. The latest matchup: Republican National Committee Chairman Michael Steele vs. Mitt Romney, the former Massachusetts governor and a likely frontrunner for the 2012 Republican presidential nomination. 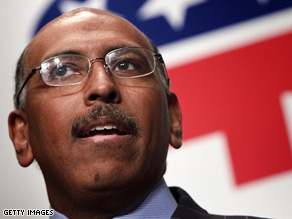 RNC Chairman Michael Steele has been unexpectedly “freewheeling,” one CNN analyst says. Steele cast doubt on Romney’s conservative credentials Friday and said the Republican base rejected Romney because “it had issues with Mormonism” and was unsure of Romney’s commitment to opposing to abortion rights. Republicans seem to be in a debate about what they believe in. That is the issue. Some person or persons will step forward to lead, we expect, from a pool to include the likes of Governors Charlie Crist in Florida, Rick Perry in Texas and lots of others great politicians and public servants. The Rush, Cheney, Gingrich debate seems to be part of the process of re-discovering our values and roots…. Republican politicians have failed conservatives, the GOP itself and America. We’re heading down the tracks to socialism or worse, with the GOP as caboose. Conservatives can share the blame, but not for reasons expressed by the liberal media aligned against us. Sadly, too many conservative leaders either blindly supported former President George W. Bush, Karl Rove and congressional Republicans or were silent as big-government politicians abandoned conservative principles and massively expanded government. Conservatism itself wasn’t the problem. According to polling conducted by my friend Kellyanne Conway, the word “conservative” remains more popular than “liberal,” “Democrat,” or “Republican.” But if conservatives ever expect to come to political power in America again, it will only be because we, not GOP politicians, provide the primary opposition to President Obama and Pelosi Democrats. Grass-roots conservatives provided the leadership ideas, work and money for the Reagan and Gingrich revolutions. In previous decades, we didn’t look to Republican politicians for leadership; we provided it. Of the two main American political parties, Republicans are now clearly distinguished by their driving desire to lose. Every faction seems determined to rule the kingdom of irrelevance. Charlie Crist announced his run for the Republican Senate seat from the state of Florida today. The highly popular and successful governor is a moderate in keeping with those that favor a “big tent” for Republicans…. As was evident at the White House Correspondents Dinner, it is deja vu, 1961, all over again. We have a young, cool, witty, personable president – and an adoring press corps. What is also evident is that, without its new superstar in the lineup, the Democratic Party is a second-division ball club. Harry Reid and Nancy Pelosi are not terribly formidable. Last fall, the Congress they ran had an approval rating below Vice President Cheney. Why then is the Republican Party agonizing publicly over what it is supposed to do? If history is any guide, the pendulum will swing back in 2010. After all, in 1952, Eisenhower was elected in a more impressive victory than Obama’s, and ended the Korean War by June. And, in 1954, he lost both houses of Congress. Lyndon Johnson crushed Goldwater by three times the margin of Obama’s victory. He got Medicare, Medicaid, voting rights and a host of Great Society programs. And, in 1966, he lost 47 House seats. Ronald Reagan won a 44-state landslide in 1980, cut tax rates – and proceeded to lose 26 seats in 1982. Bill Clinton recaptured the presidency for his party in 1992 after 12 years of Republican rule. In 1994, he lost 52 seats and both houses of Congress.